I have to admit that from the title, I was expecting a really powerful book, and while I liked it, it really didn’t feel like Joan Bolker’s Writing Your Dissertation in 15 Minutes a Day nor Patrick Dunleavy’s Authoring a PhD. The great thing about this book is that it is a guidebook, so your doctoral students (if you’re an advisor) or you (if you are a student) can keep it handy for reference. Be forewarned: this book’s author’s writing reveals a certain old-fashioned element that makes me think that this book wasn’t even written in the 1980s. How can using a computer even be a question? The book edition I read was from 1981, though it’s been reprinted several times. 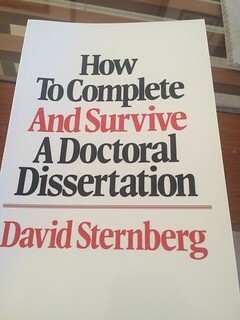 At any rate, “How to Complete and Survive a Doctoral Dissertation” is the kind of book that I can recognise makes a concerted effort to really understand what the doctoral student is going through. While Sternberg’s use of the word “depression” seems to me ill-suited, and I’m really uncomfortable with his apparently casual usage of the concept, I strongly believe he is genuinely interested in the well-being of doctoral students. As I read the reviews of this book on Amazon, I realized that the reason I liked Sternberg’s book is that it’s not too long, not too short. Whereas Davis’ systematic approach book, to me, is way too short (as is, in some ways, Bolker), both Sternberg and Dunleavy felt to me the right length for a book aimed at helping doctoral students. Sternberg is clear on issues we all agree upon (by we, I mean everyone who writes about academic writing and doctoral supervision and dissertation completion): you need a dedicated space to work on your thesis and you need to treat the PhD like a 9-5 job. I should note that this definition of a PhD advisor is MINE, not Sternberg’s. This is where you can detect that this book is old, and its author old-fashioned. I’ve written a lot about vulnerable communities and how we can be sensitive when studying them, so I disagree with Sternberg here. This (the fact that Sternberg addresses when a PhD can go wrong) is one of the selling points for the book. Overall, the Sternberg volume is a nice overview of the doctoral dissertation writing process, includes *some* but not all of the discussions you need to have with your PhD advisor on methods (qualitative, quantitative, experiments), AND is a much more frank and honest book than for example, others that purport to teach you how to finish your doctoral dissertation in two semesters or less. I would recommend it, but again, I wouldn’t do so without additional volumes that can complement the gaps that this book has. Though this is one of the most complete ones so far from those I’ve read. Tagged with doctoral dissertation, PhD, PhD advice, reading notes.